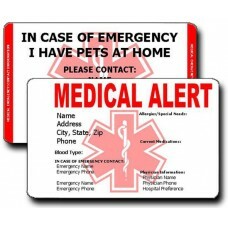 These Medical Alert Wallet Cars are printed with important medical and contact information for you and/or your pets. Each style of card comes with your choice of a red Horizontal or Vertical bar. 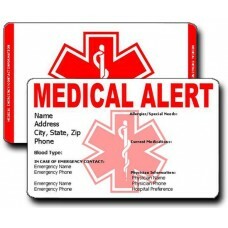 When placed in your wallet it will show alerting emergency responders. 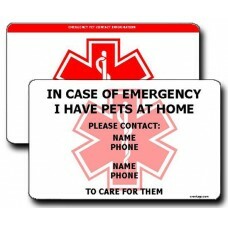 These Emergency Pet Contact Information Wallet Cards will be custom printed with the name and phone .. 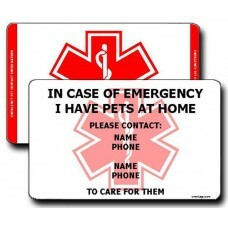 These Vertical Emergency Pet Contact Information Wallet Cards will be custom printed with the name a.. 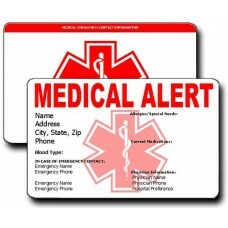 This Medical Alert Wallet Card will be custom printed with your medical and personal contact informa.. 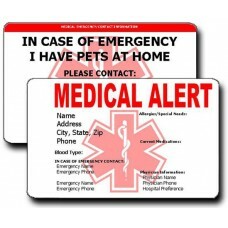 These Medical Alert/Pet Emergency Contact Information Wallet Cards will be custom printed on one sid..